Posts related to our work for The Coaster Crew, a roller coaster enthusiasts’ club in the United States and Canada. Why should I be in a coaster club? What can I do in a coaster club – specifically, in The Coaster Crew? 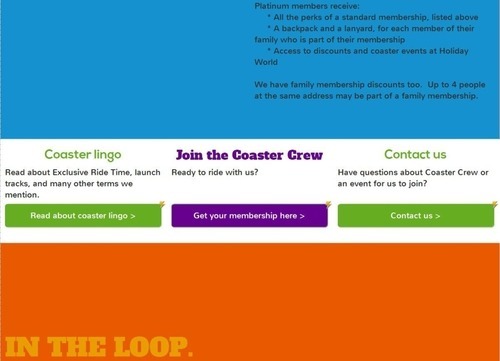 In later articles, I described my design process for several of the pages on the site: the new homepage, the new In the Loop page, the events list, and a page inviting users to participate in the Coaster Crew Network Forums. 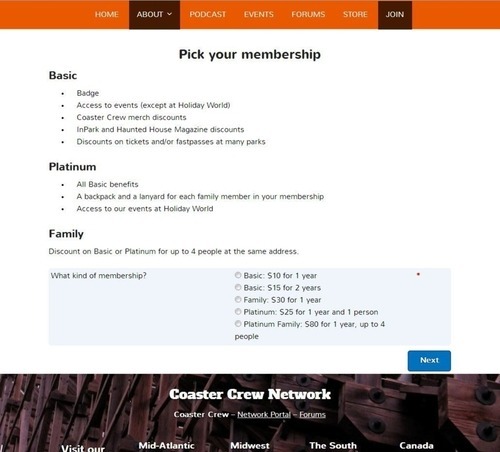 Most recently, I explained the Coaster Crew Network bar, which appears in the footer of each page of CoasterCrew.net and (in the future) the fansites to allow users to navigate around the network more easily and be more aware of all of the sites the organization offers. I skipped over the About page intentionally. Because it is a complex page with multiple sections and many iterations in its design, I wanted to describe it last. Read on to see how several sections within About the Coaster Crew came to life. The original sketch envisioned an infographic with a playful design below an attention-getting mission statement in a blockquote. 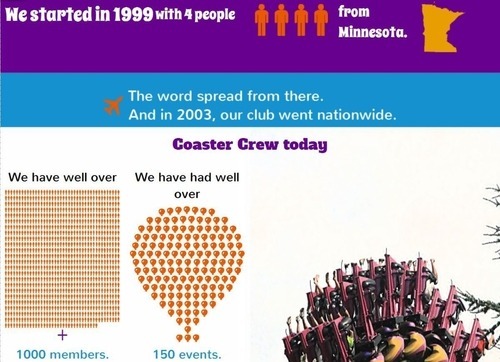 The infographic was going to tell the Coaster Crew’s story of how they increased from 4 members to more than 1000 in less than 15 years. 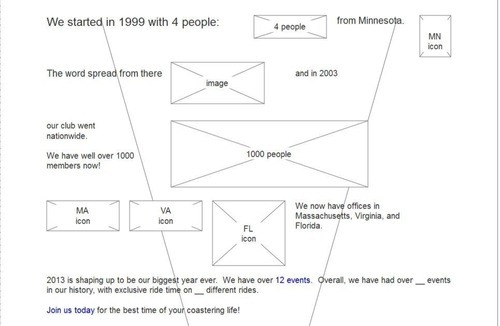 The copy for the infographic was already on the old Coaster Crew site’s About page, but it had not been styled to get users’ attention more. The original mission statement in my redesign looked like a block quote printed for a poster. 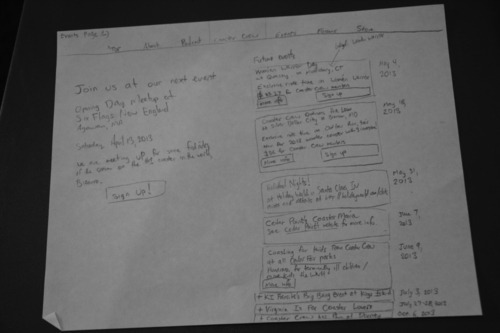 Here is the original wireframe. At this point, no decisions had been made about the background image. The second iteration of the prototype included the fonts and the first background image. I decided to use Intimidator 305 for this picture because it has been the centerpiece of several of Coaster Crew’s biggest events since its opening in 2010. After two rounds of usability testing and feedback from the Coaster Crew staff, I used a more traditional row layout and dropped the novelty fonts. The text was easier to read after adding shadows behind it in development, but user testers still found it too hard to read. The new background picture, also of Intimidator 305, was taken by a member of the KDFansite staff and donated for this site. To enhance readability and make the mission statement pop more, I put a full-width yellow panel behind the mission statement text. I also switched the fonts to different-weight fonts in the same typeface to keep a common theme with the fansites’ design, which are currently using different weights of Open Sans. The About Us header was added for consistency with other pages of the site after we switched the layout back to multi-page. On mobile, the mission statement displays as one long, single column. The emphases on different phrases within the mission statement becomes more obvious. Here is the original layout for the infographic, which was focused on the pictures. Here is the first round of the infographic with pictures. I was unhappy with the broadcast icon used here because its background was still visible. Several of the graphics were full-width and did not scale well for mobile, so I changed them after receiving this feedback in testing. The layout changed slightly after I migrated it to Zurb Foundation 4.3’s responsive grid system in development. Throughout this project, I challenged myself at several junctures to find the part of the design that I liked the least and improve it. The About page, especially its infographic, easily stood out the most. I decided to edit every image I had used in the infographic. I switched to a four-column layout with the last two columns empty to show a train for Great Bear going by. The focus moved more toward the number of members an events and away from the less important number of states where we have offices. That is because users are more interested in an organization’s benefit to them (and the organization’s proving it) than in an organization’s structure. 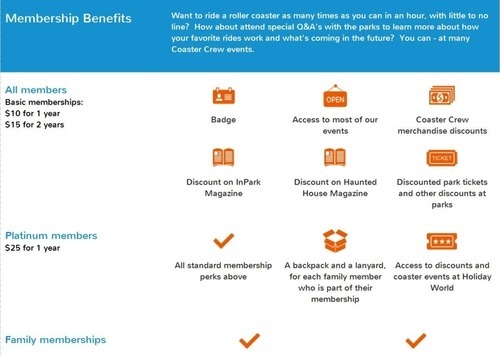 The infographic would lead to a call to action for people to join The Coaster Crew and attend events. 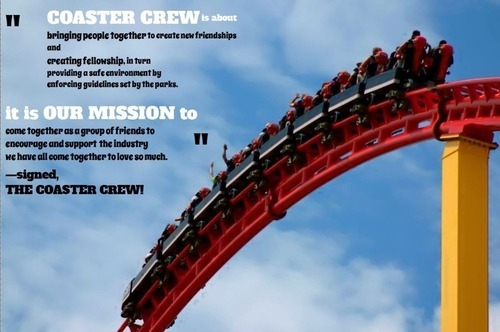 Here is the call to action to join Coaster Crew at the bottom of the infographic. The infographic displays like this on a mobile device. The mobile layout’s single column keeps viewers more focused on the statistics that the infographic is presenting. The state icons display in three columns to save space and keep viewers’ attention on the statistics. The original layout took on a zigzag pattern and provided space for other content such as images in the empty parts of the page. Testers had trouble trying to find the part of the site which talked about membership benefits. Changing the more creative but less obvious “You may ride again.” header to “Why join?” was the first move toward rectifying this. I redesigned the rest of the About page, including the Rules section, after the second round of usability testing. After the icons in the Events section received very positive feedback in testing for being able to attract users’ attention, icons were added in the Forums and Membership Benefits sections. I added the prices in the left column based on tester feedback. Some usability practitioners speculate that on mobile devices, the first page has replaced “above the fold” with regard to page content. Mobile users are more likely to scroll up and down pages than to tap links to other pages. So I added a quick blurb of copy about the events to the Membership Benefits header. 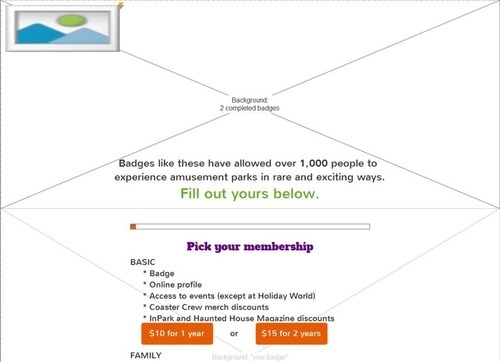 Per a tester’s recommendation, I added dividers to distinguish between the levels of memberships. 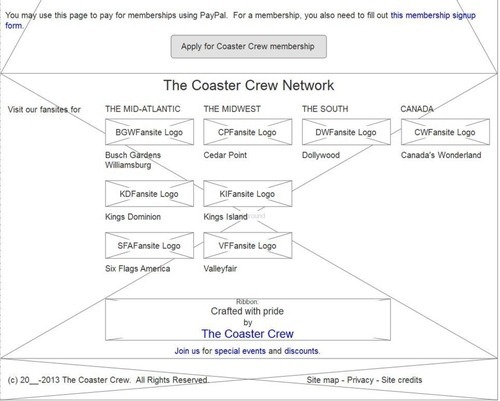 The Coaster Crew Network row moved below the Membership Benefits in the final layout. 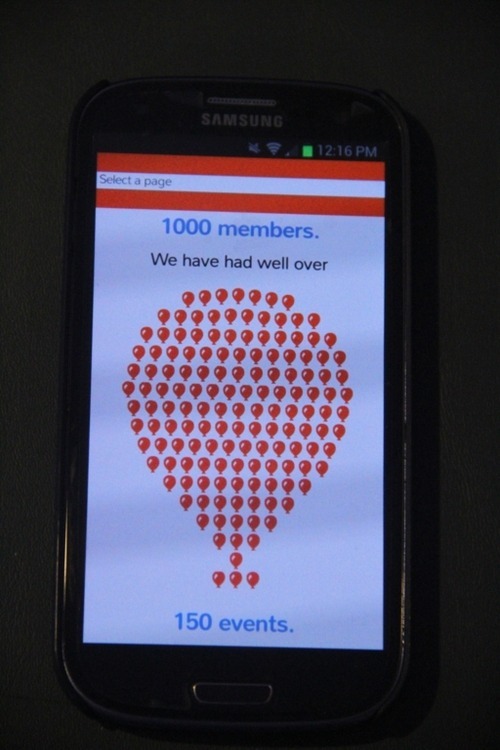 Users were generally more able to comprehend the membership benefits and network when each was presented across one full row. They are more able to think of this as one unit rather than having their eyes bounce back and forth between columns with unrelated information. 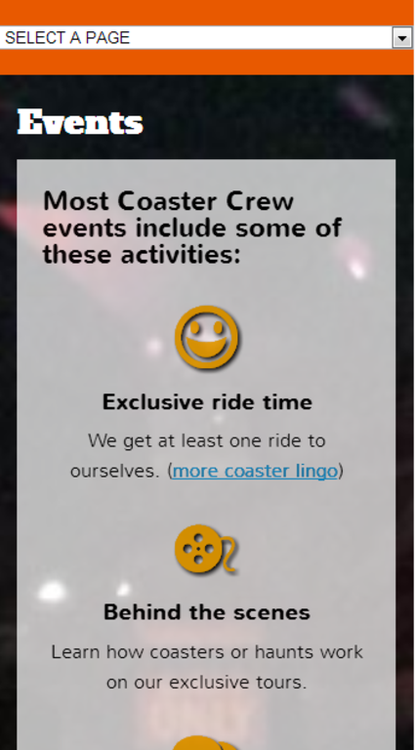 You can see the About page live on the Coaster Crew site. You may also view my design stories for the other pages on this site here: Intro, Personas, Homepage, In the Loop Podcast, Events, Forums, Signup, and Coaster Crew Network Bar. I am a user experience designer specializing in the amusement industry. I work for amusement parks, ride companies, coaster clubs, and any other company or organization affiliated with amusement. If you would like to hire me, please contact me through my website or tweet at @AmusementUX. You can also like my company’s Facebook page or follow me on Twitter. Ever since the new Coaster Crew website launched in September, I have been writing articles describing my design process and design decisions. The series began with a post about how I learned about both the roller coaster enthusiasts and the “general public” segment of The Coaster Crew’s audience and determined how to best target the site toward the general public while still meeting enthusiasts’ needs. 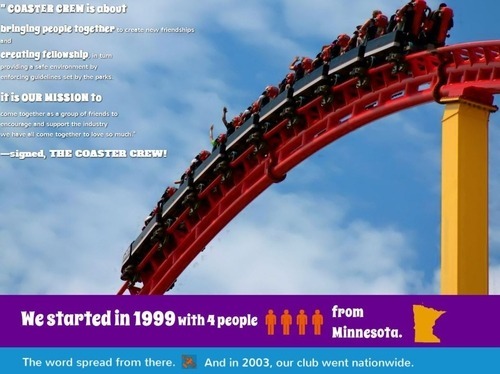 Later posts outlined how several of the pages on the site came to be: the new homepage, the new In the Loop page, the events list, and a page inviting users to participate in the Coaster Crew Network Forums. I also went over a new membership signup flow which is not currently on the live site due to technical limitations. 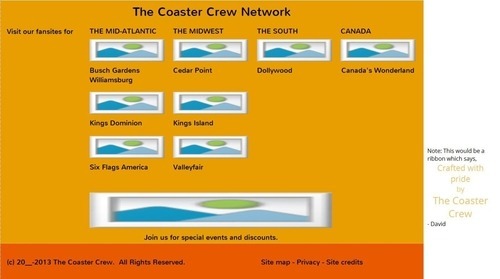 Today, I’ll discuss how the Coaster Crew Network ties together with a feature that you can see now on CoasterCrew.net. They later launched fansites for Busch Gardens Williamsburg and Six Flags America. 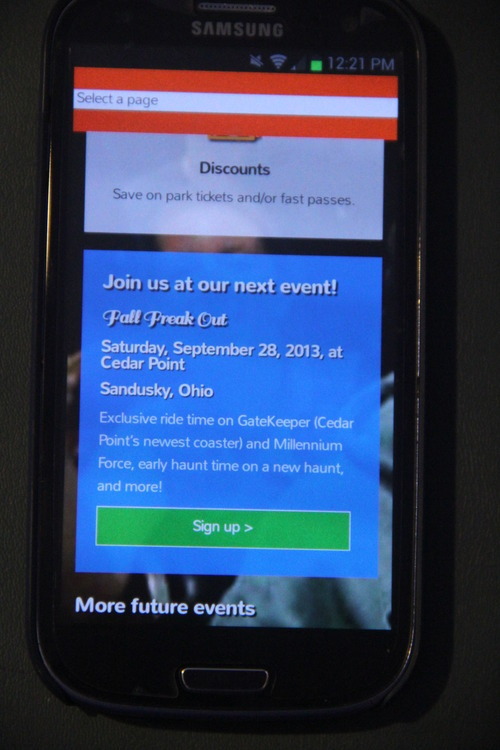 Most recently, they have added fansites for Cedar Point, Kings Island, Canada’s Wonderland, Dollywood, and Valleyfair. 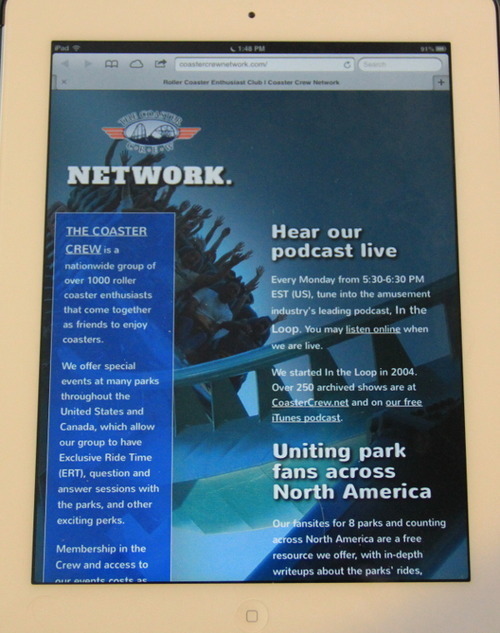 The Coaster Crew Network site originally just served as a gateway to their forums. Earlier this year, I launched a complete, responsive redesign of that site with a focus on tying together all of their fansites and social media channels and providing a consistent look and feel with the other sites I have been redesigning for them. Selling users on the idea of the fansites as being part of a network is important for the Coaster Crew. The fansites have not always had a consistent way to navigate between them, and it can be hard to remember which fansites are in the network. The staff suggested a network bar in the sites’ header or footer. I decided that since tall footers with site maps are common in designs today, I could merge the network bar into a tall footer. 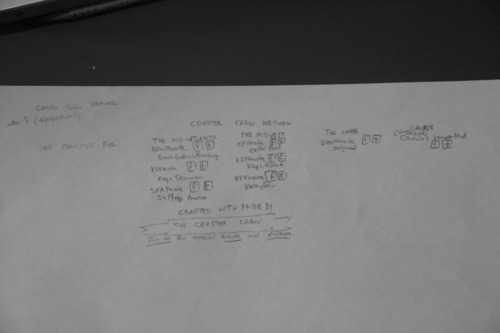 I sketched five different ideas for the network bar at the beginning of the project. The first was a simple listing of all of the fansites across one row. The second divided the list of sites into four columns. The third put the names of the parks with the fansites. The fourth arranged the sites in columns by the park chains represented by each fansite. The layout that seemed to scale best arranged the parks by geographic region. It seemed to be the best at handling new sites’ being added to the network bar. If park chains sold a park, we would not need to update the network bar and users would not be wondering if we still had a fansite for that park. I tested each idea’s strength by creating wireframes for them. The first three ideas seemed to work for a header or a footer, while the last two were definitely for footers. In addition to scalability, the fifth idea also seemed the best for the design since a tall footer on each page would allow for some strong design ideas there. I continued to work on that idea through the prototype and later stages. In Axure, I initially added bright colors for the network bar before I knew what the background pictures would be. The copyright and footer links were initially very minimal at the bottom of the page. I took this background picture of El Toro with a point-and-shoot camera. It has remained the desktop background on my old desktop computer for several years. This picture seemed to go very well with the network bar, so it became the background. I built the network bar locally using Zurb Foundation 4.3. The fansite’s logos fill 100% of their container’s width with auto height. The copyright and map statements were minimal. User testers seemed to receive this layout well, but I thought more could be done with it. It also didn’t have the ribbon yet. For performance reasons, the live site on mobile doesn’t keep the background in one place. It shows the fansites two to a row instead of four to a row to size the logos ideally for the smaller screen. 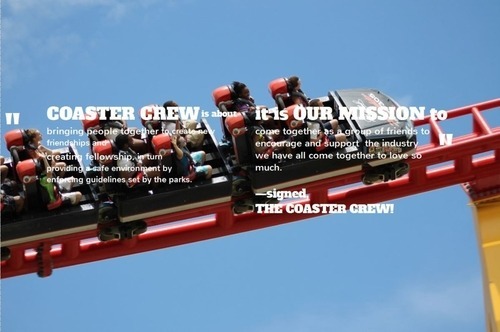 The footer now features a panel with the Coaster Crew’s mission statement. The network bar currently takes almost exactly one screenful for a tablet in landscape orientation. In portrait mode, most of the blue footer panel can also be seen. Zurb Foundation 4.3 automatically hyphenates words on mobile devices to keep the parks’ names from becoming too wide for their columns. 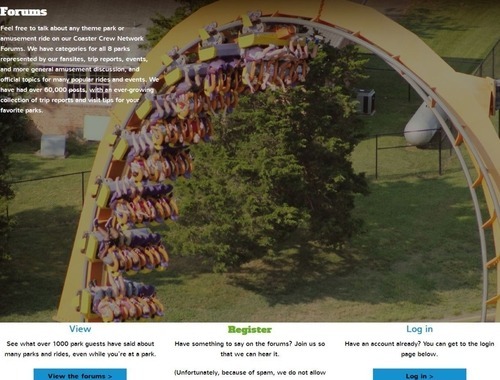 The desktop layout shows the blue footer panel mostly obscuring the roller coaster hill behind it. 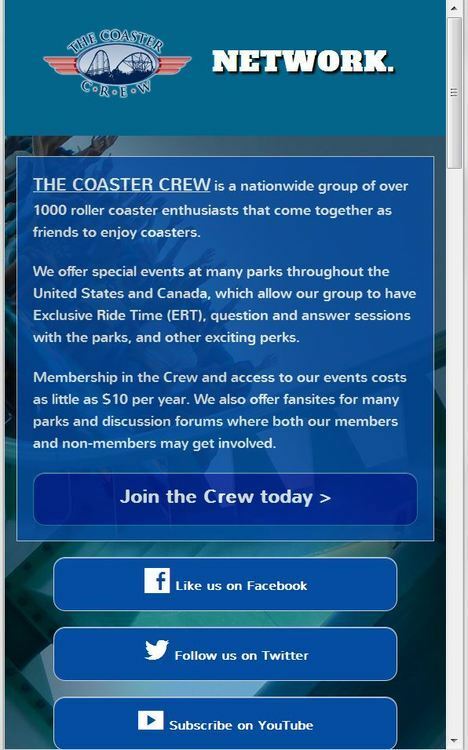 It gives clear access to The Coaster Crew’s social media channels under the club’s logo in the footer. Lastly, here is a preview of how the network bar will look on the redesigned fansites. I did this as an overlay, similar to the In the Loop background, because each fansite has a different color scheme and that will allow each fansite’s personality to translate into its network bar design. This is a prototype and still subject to change as the sites move toward going live. 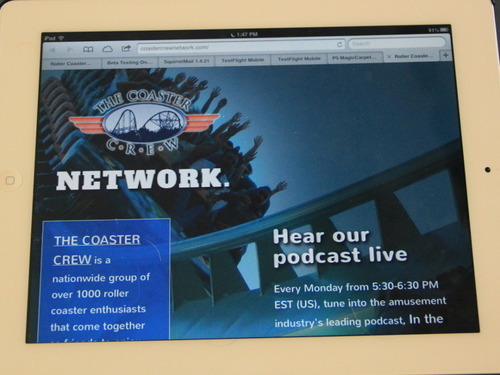 You can see the Coaster Crew network bar live on any page of the Coaster Crew site. The next and last article in this series will discuss the About page: the best example in this project of my consistently pushing myself toward a better design. 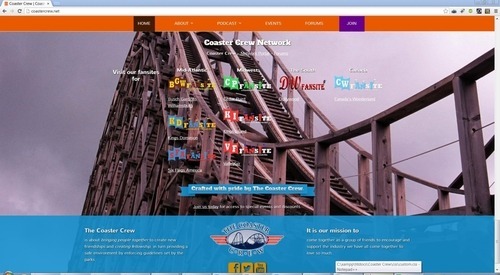 The new Coaster Crew website launched in September. I’ve been writing articles about our target audience and how each page on the site came to be (Homepage, In the Loop, Events, and Forums). Today, I’ll show you something that isn’t on the live site. 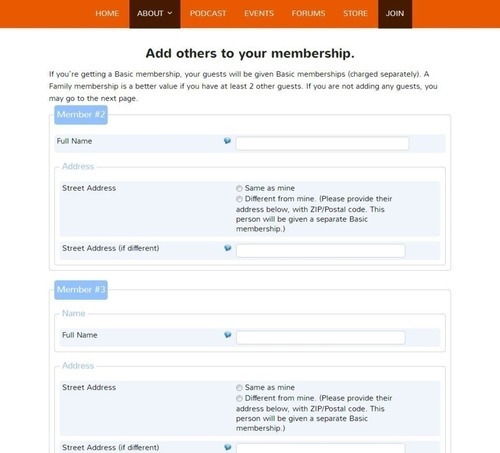 I designed a new membership signup form, which was available in the prototypes that we tested with users. My original idea was to allow people to fill out their own membership badge. This would have been displayed next to completed membership badges. Fresh off of conducting a round of surveys for this project using AYTM, I was used to pretty robust tools. So my design for this form had a good deal of skip logic, custom buttons, and a full order review. I tried adding input fields within labels as the third slide depicts, but our plugin did not support that. 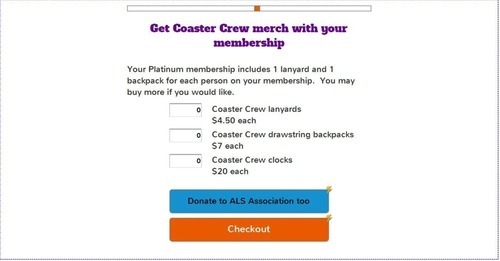 To allow a quicker checkout process (and probably boost conversions), I made it possible for users to bypass the Coaster Crew merch and charity donation steps. I added some space for the badge background and some copy in the wireframe. The low-fidelity prototype already had a full set of input fields and logic for navigating between the pages of the form. For internationalization reasons, I used “First/Given Name” and “Last Name / Surname” language. In this form design, I really wanted to highlight natural language. Interacting with one of these sites should not feel like interacting with a computer. I recently saw an insurance website whose search form is just “I drive a (car’s year, make, and model), and I live in (ZIP code).” That language makes a website feel human. Websites’ forms are often terse, and interacting with them feels like interacting directly with a machine. It is likely that we would have needed a premium e-commerce form to handle the skip logic and purchasing logic here, even though the choices are quite simple for users. 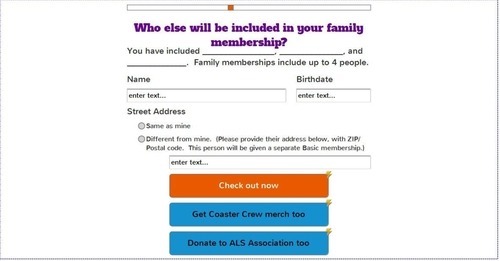 This screen would have detected whether users had selected an option in the beginning that would have not given them the best possible deal on their membership. Another way to do this would have been to ask for the user’s and their guests’ information and recommended a membership type based on what they had entered. This may have required disclosing the price to be a later step and felt like bait and switch to people who had seen a low membership price advertised on the pages that gave them links into this checkout process. This order review slide cannot be developed with the plugins available to us at this time. This is how it was intended to work. 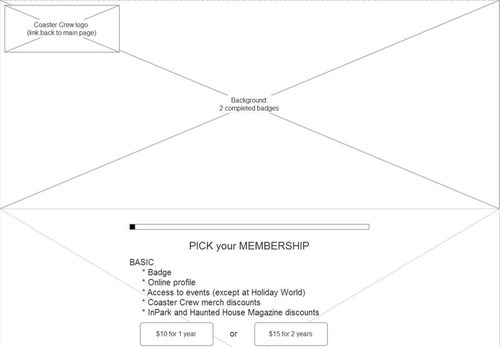 There were actually 12 steps in this signup process, including all guest information pages. I have omitted the rest from this post for brevity, but for the near future I will make the wireframe and prototype available online. Submitting that form does not actually submit any data, so feel free to try it out. A few screenshots of the prototype are available below. The overall page used some copy which did more to highlight the benefits of membership in our club. 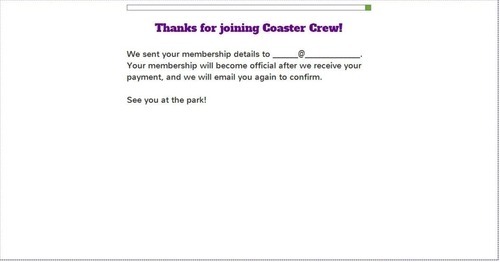 If users opted to go to this screen, they could add Coaster Crew merchandise to their membership order. Some users in early rounds of testing had not remembered that some merchandise was included with their platinum memberships, so I added that copy here. The charity slide had a quick writeup explaining that the ALS Association raises money for research related to ALS (Lou Gehrig’s disease). I recently launched a site for a non-profit, and I know that people want to know more about the charities they are giving to without being asked to give out of guilt. The payment page would have included the order total, calculated from previous slides’ data. Users really needed to know this, and Coaster Crew staff required it, but we couldn’t find a free plugin that would meet our needs. 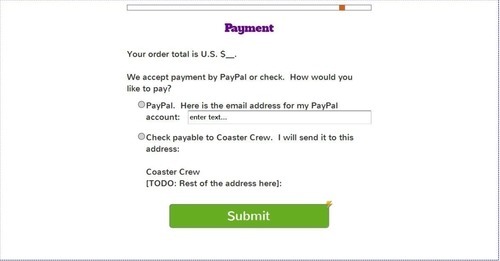 This confirmation page assumed that Coaster Crew staff needed to process PayPal payments manually, but the staff wanted that to be an automatic process. That is the technical reason why we needed to be able to calculate the payment amount. 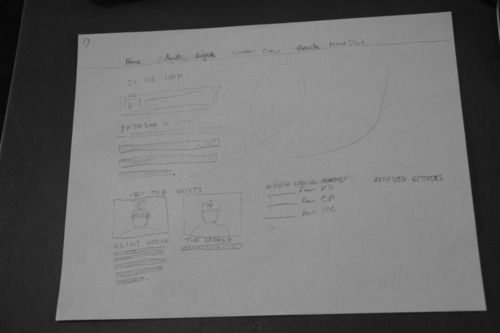 The prototype’s form had 12 pages, like the wireframe’s. The prototype will still be available online for the near future. Our beta site, which is still online as of this writing, had the signup form implemented with the closest plugin we could find to what we needed. Here is how it looked in the desktop layout. The benefits of each membership type were reprinted here so that this page could serve as a landing page. 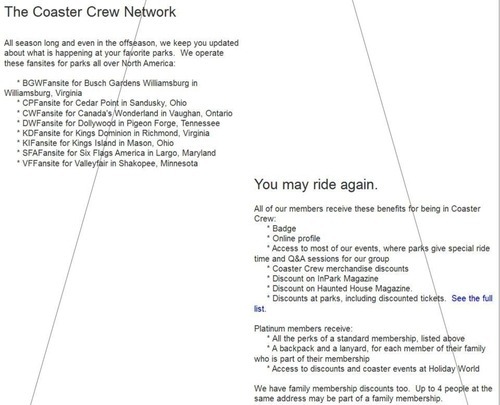 Commonly, The Coaster Crew shares out the link to their membership page directly rather than sending out a link to their homepage or another page. Because our plugin did not have skip logic, I combined all of the guest signup information onto one longer page and made all fields optional so that users signing up for individual memberships could skip it with one click. This confirmation page shows up when users submit their membership information. Here is an example of how the form displayed on mobile. I wrapped our form plugin instance within a Foundation framework (4.3) column class so that it would be responsive. So due to technical limitations, the new membership signup form didn’t go live. The live site shows the first page of the signup form but with a button at the bottom to take users into the old signup process on a separate server. The closest we could get while I was working on this project was BreezingForms, which lets you build multi-page forms for free. This plugin was in use on the beta site. Since we were using this form for e-commerce, being able to carry prices forward was very important. Our site’s new store runs on WooCommerce, but the free version of that doesn’t do the calculations that we need for memberships and event signups. 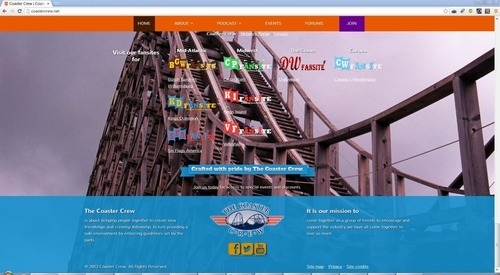 I have recently been explaining the design decisions for the new Coaster Crew website, which launched in September. During this series, I have demonstrated how I came to understand our target audience and have illustrated my design process for the homepage (this site went from a multi-page layout to a one-page layout and back! 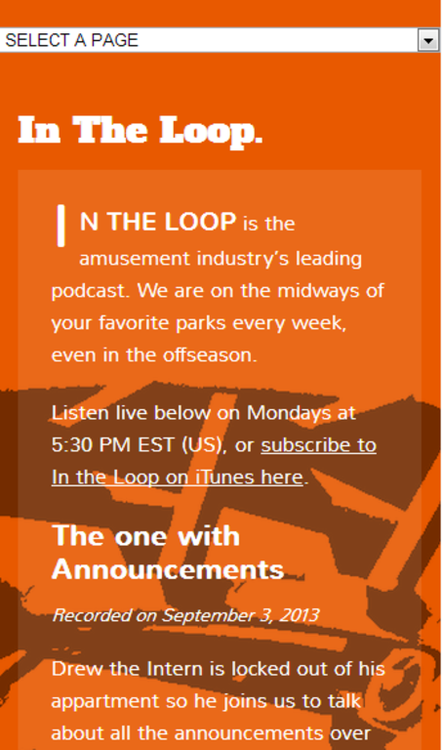 ), the new In the Loop homepage, and the Coaster Crew events list. Today, I’ll look at a page which received some very interesting feedback from users: the Forums page. As a freelance user experience (UX) designer, I wear a lot of hats for my one-person business. Part of this means I maintain accounts on a lot of websites: social media sites, sites for freelancers, software vendors, and many more. Before I started using a password manager, I was forgetting a lot of passwords. When I evaluate a website or app, one of my first gripes tends to be this: they assume I will create an account without telling me why I should. The worst offenders make me sign in before I even see what their site is! 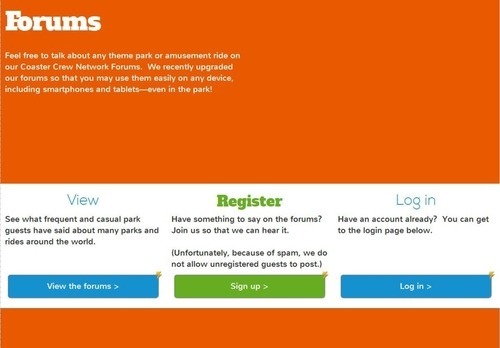 That’s one of the big reasons why every park, every ride company, every coaster club, and every other amusement-related organization with a website needs to have their target users test their site. 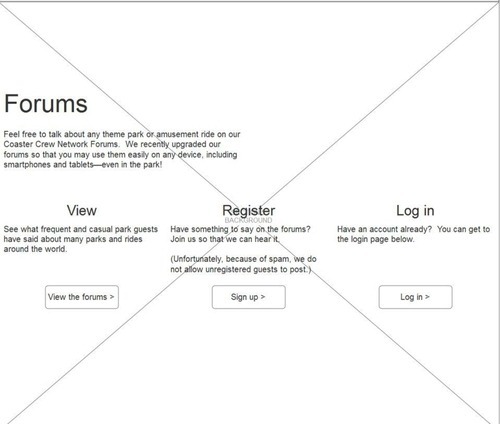 Here is my initial wireframe for the Forums section. Part of a one-page layout, users would have seen this after the Events section. The content seemed to stand out well enough at this stage of development. But as other sections of the page evolved throughout my design process, this section got lost. 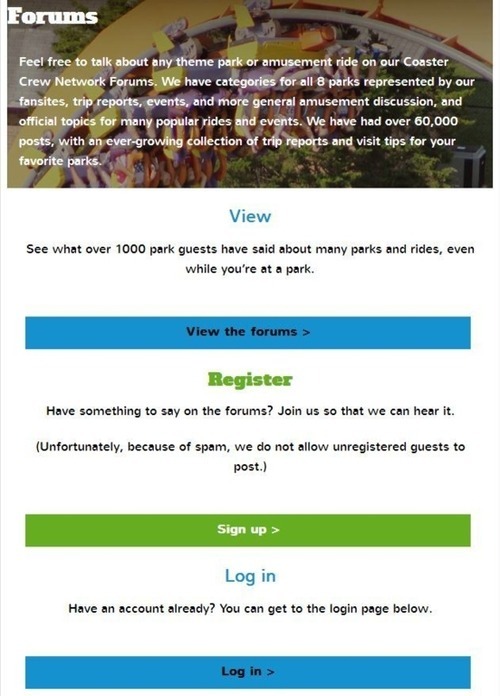 And that was a problem because The Coaster Crew is trying to increase their forum activity. 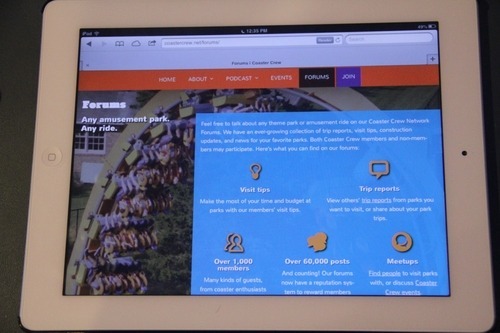 The original prototype gave the Forums section a similar white-on-orange color scheme to the Podcast section. This provided good consistency through the one-page layout. I was planning to add a background picture but had not yet decided which ride it should be. I decided on Dominator at Kings Dominion for the background picture. 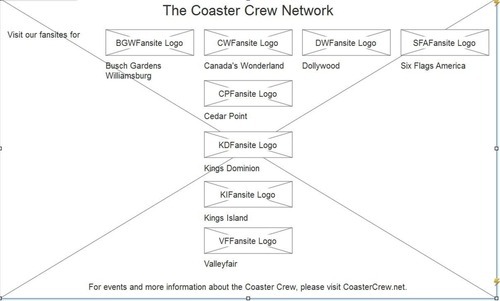 Several years ago, the KDFansite forum merged with the Coaster Crew Network forums, where it became a board within the larger network’s forums. It’s still the most active part of the forums. The most active topic was the Intimidator 305 announcement, but I decided to use an I305 picture as the background for the mission statement. More users would see that in the one-page layout because that was almost prime real estate in that layout. The background picture in this mockup was just a placeholder. I had taken it on the way out of Kings Dominion several years before I bought a professional camera, and it was an old Facebook upload. It did the job for a prototype even though I needed to make the picture bigger, but I wouldn’t use a background picture like this in a live site. 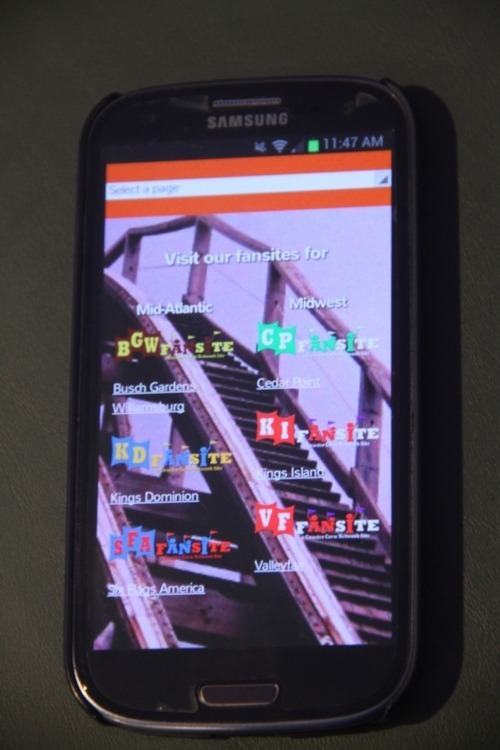 Our first round of user testers saw the prototype with this background image. By now, I had a much better picture of Dominator thanks to Nikki at KDFansite. I darkened the picture slightly to make the section’s text easier to read. I also decided to put the calls to action on their own row instead of in front of the picture. Users did their second round of testing on this beta site. Here’s the forums section at this stage in mobile width. One of my questions for user testers in the first two rounds was, “Do we present good enough reasons to join the forums?” One positive thing they mentioned was actually the Register call to action. They didn’t want to see spam on the boards. But users also didn’t find the Forums section that eye-catching in this layout. By this stage, I had added icons in several other sections of the site. They found those sections drew their attention more. Going to the next round of user testing to the third was a big leap. I added a panel for readability and icons to draw users’ eyes. Some users in the last round of testing remarked that I had drawn attention to the wrong features of the forums. The number of members and number of posts sounded more intimidating and tedious than helpful when it was placed in the top row. I ended up moving those down and putting the visit tips and trip reports at the top on the live site. The site looks very similar on a tablet. Here is the row of calls to action on a tablet. At mobile width, the page draws users’ attention toward viewing the forums before registering. This width is the best for this flow of events. Users now expect to be given concrete value before they register for a site. When I was directed to split the site back into a multi-page layout, this created a new challenge because each section needed to be represented well on the homepage. I opted for a shorter section of copy and just a few of the forums’ features to make it onto the homepage. 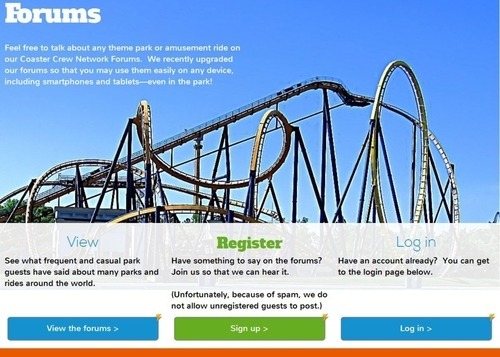 In the live site, the social media section appears right below the forums section to enhance the feeling of being part of a community of coaster fans. 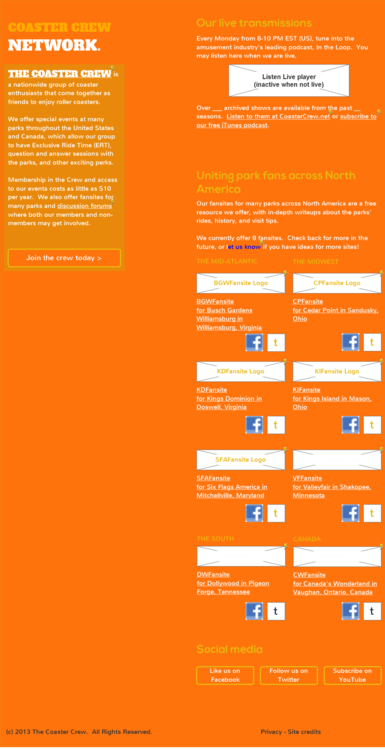 Further up the page, users are given a list of events for real-life meetups. The forums and social media sections encourage discussions at any time of the year, regardless of whether or not parks are open. Actually, in my experience as a Coaster Crew forum moderator, forums get quite a lot of activity in the offseason too because members take the offseason to speculate on what will happen at the parks in the following season. In the mobile width, I hide the icons on the homepage and try to just communicate the right things with the text. I didn’t want to go too far off of the desktop width for this because the mobile site and desktop site are the same site. The design both adapts to users’ devices and responds to their window size. 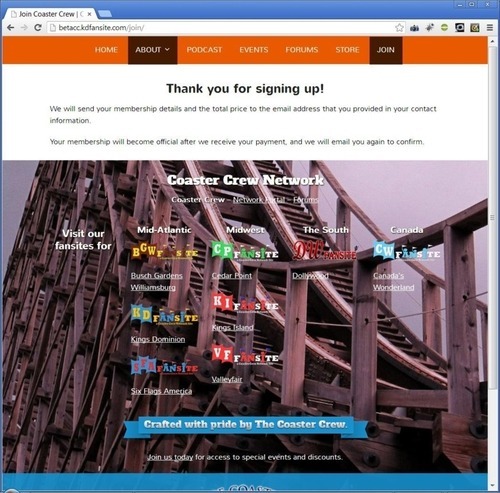 Thanks for reading about Coaster Crew’s new forums page. You can see it live here. The next article will detail a new signup flow I designed for the Coaster Crew site, which could not be delivered yet due to technical limitations. I’ll close the series with posts about the new Coaster Crew Network bar and the About page. The new Coaster Crew site went live recently. I designed it, and in a series of articles I have been explaining how. First, I explained some of the design considerations for refocusing a coaster club’s site toward the general public and not only toward coaster enthusiasts. 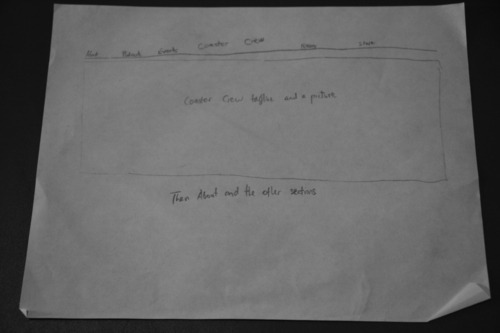 Then, I showed how the new Coaster Crew site moved from a multi-page layout to a single-page layout and back. Most recently, I walked through the new In the Loop homepage – from sketches to wireframes to prototypes to a live site on several different devices. 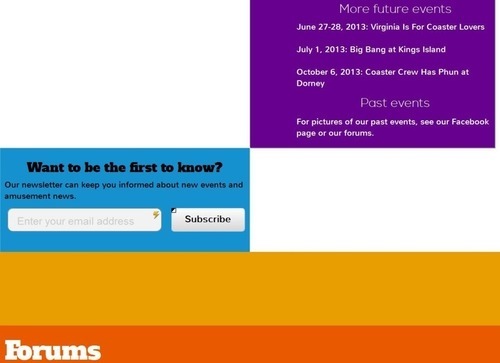 Today, let’s look at how the design for the Events page changed over time. It’s one of the more visually striking pages on the live CoasterCrew.net site now, but the design today is a radical departure from how it looked earlier in this project. As with the other pages, I began by sketching some ideas that I had selected earlier. 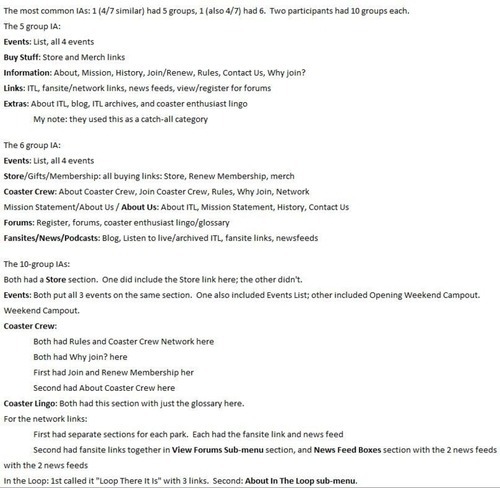 This first idea called a lot of attention to the very next event in hopes that 1) people wanting to go to multiple events would be able to keep track of what is next and 2) Coaster Crew might get more signups to events that they need to fill up soon. This is the idea which got selected early on and lasted well into usability testing. The final design turned out more like this idea. This idea highlighted the next three events, which are usually all at different parks around North America. Site visitors could easily see which events would be closest to them. The top row of 3 was the idea that persisted and became part of the live site’s homepage. In reality, we went with a hybrid of these two original sketches. 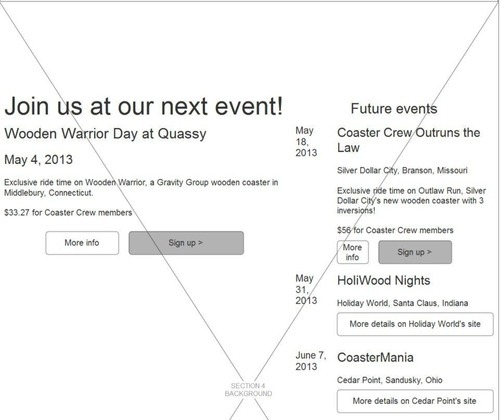 In the first wireframe, I used the original idea of highlighting the next event on the left. ”Join us at our next event!” would have been the page title. 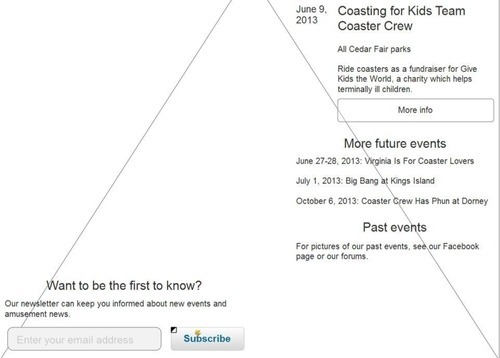 The page would continue with more future events, “save the date” notices, and a way to sign up for The Coaster Crew newsletter to find out about more events. With no background image, the first prototype looked like a Windows 8 style flat design. That’s not what we were trying for here. I also later decided after a round of usability testing that less was more regarding the fancy typography. Rather than using multiple fancy typefaces, I opted for multiple weights of one typeface with other fancier display fonts used sparingly. This design strategy will be used on the fansites too. I liked how the newsletter call to action turned out in this layout. I never liked this transition between the events list and the forums. In later iterations, I used background pictures more liberally to help the flow between the sections. This background image overlay came from BGWFansite‘s special hard hat tour of Verbolten. My intention here was to show an example of one of the perks that Coaster Crew members get at events. I edited the background image the way I did to have consistency with the previous section (Podcast). The events section received a lot of requests for changes during the second round of usability testing. Testers didn’t like how the section was very long. 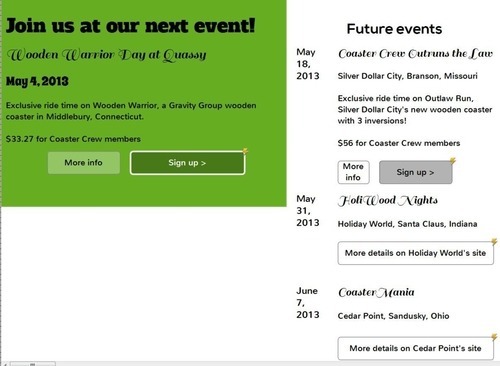 Scalability would have been a problem when the staff adds the Coaster Crew events for 2014 to the page. 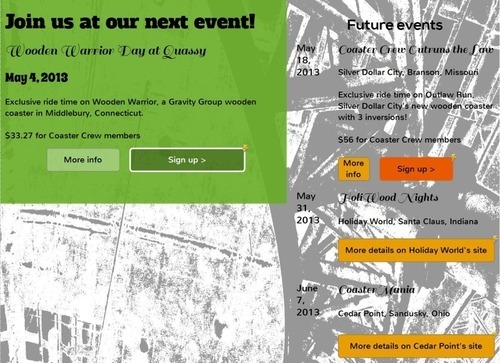 Coaster Crew already has a lot of events on their schedule for next year. Testers also wanted to know what they could expect at events, and they thought the existing page wasn’t doing this well enough. After The Coaster Crew’s Big Bang event at Kings Island with exclusive ride time (ERT) on The Beast, they posted new pictures to their Facebook page from the event. 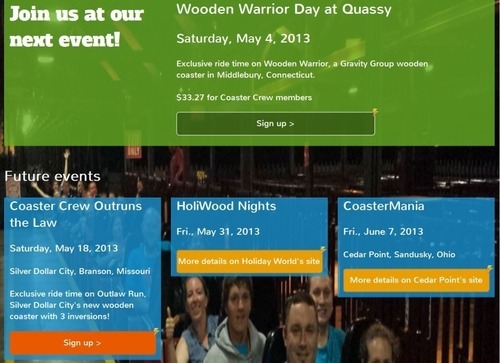 Using an ERT picture in the background for the Events section gives the page a much more human feel and helps visitors to the site connect with the organization more. Testers could tell that this was a picture from a real Coaster Crew event and were much more interested in the content because of it. I kept the page’s attention on the next event, having it fill the whole top row. The future events list switched to a 3-to-a-row layout as in the second sketched idea. The second idea also had future events 4-to-a-row after the first row, but I decided against this because it would not give enough room to display the event info on tablets. I added this What to Expect section after the list of events. It used similar icons to the rest of the site. 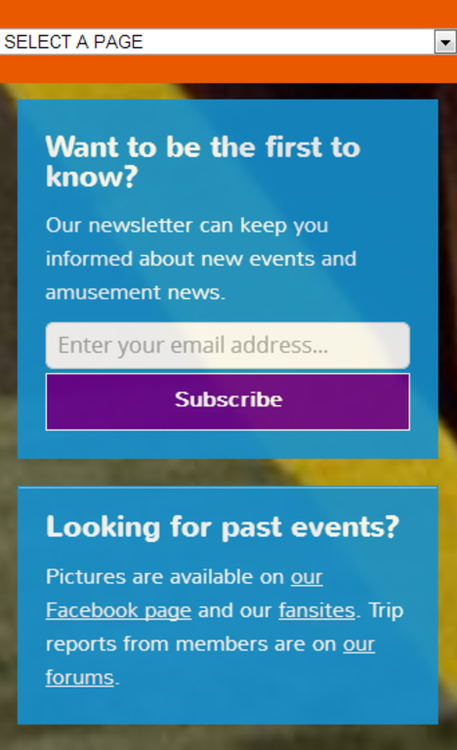 Testers eventually wanted this further up the page because it was below the fold and they thought people new to Coaster Crew wouldn’t see it soon enough to notice it. In the live site, I tightened these icons to one row and moved it above all of the listed events. Here is the live site on desktop. When the 2014 events are populated, they will fill in three to a row, left to right. The activities list shows up for all devices because users who are unfamiliar with our events may be using any device. For performance reasons, and because iOS doesn’t currently support fixed-position backgrounds, I stacked several images from Coaster Crew’s Big Bang event at Kings Island and made that one background image. The top image is a sign Kings Island had for their event group. The bottom image, shown if you scroll down on a tablet, is from a behind-the-scenes tour of The Beast. The stack of images shows up more obviously in portrait mode. You won’t see The Beast’s logo after the 2014 events are populated here. This section has the live event data that is currently in the system. 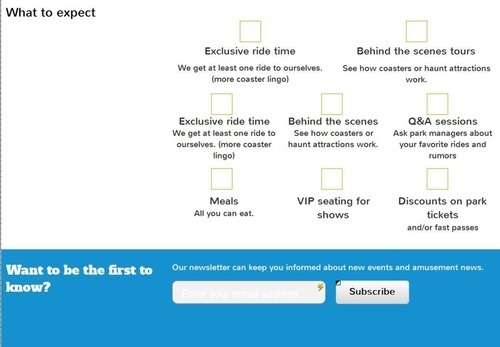 Mobile users see what exclusive ride time is front and center before they are told about events that have it. After users see what they can experience at Coaster Crew events, they are invited to the next event. More events are listed further down the page. The fall colors for the More Future Events list really stand out on mobile. Calls to action take users to places where they can get more information about the event or register. 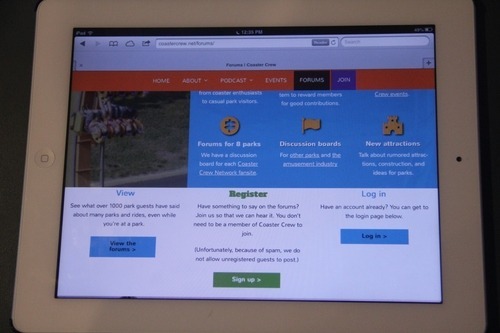 Some registrations are handled through the Coaster Crew site, while parks’ sites take care of others. The way to see pictures from past events shows up more clearly on phones. 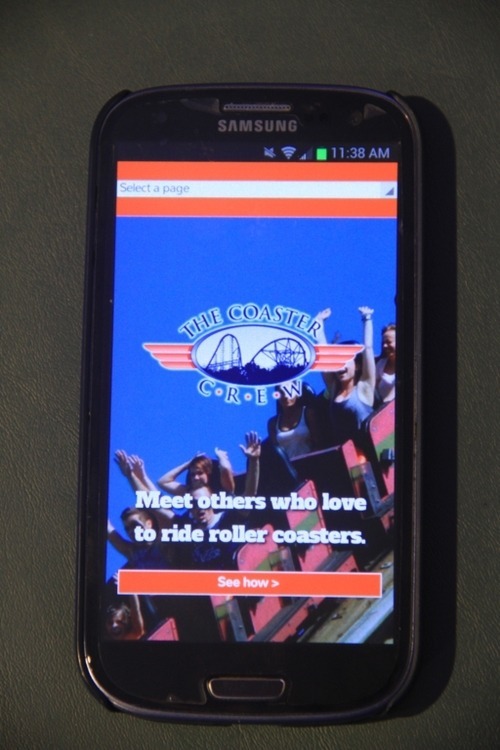 It allows users to go to the Coaster Crew Facebook page, fansites, or forums for more information. I hope you’ve enjoyed seeing how Coaster Crew’s new events list came to be. The next article is already ready to launch soon, and it will walk you through how the Forums page got built. It shows how I responded to users’ feedback to grab their attention with the design of the page and tell them why they should register for the forums. I recently launched the Coaster Crew site and explained how I came to understand its target audience. Today, I will discuss the design of its homepage. The site began as a multi-page site with separate pages for In the Loop, About, Events, and many more. These screenshots will walk through my plan to turn this into a one-page site – and how I was able to change it back into a multi-page site, keeping many features of the one-page design. 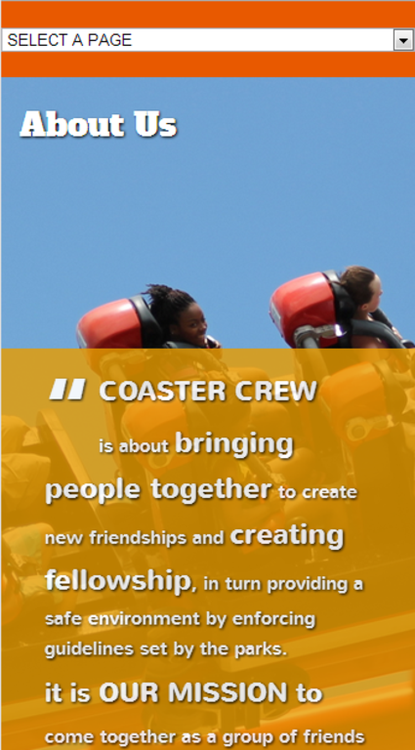 The new Coaster Crew homepage differs significantly from any of their previous designs. 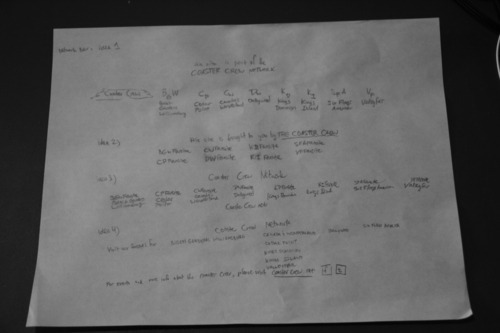 In the first sketches, I originally envisioned the new CoasterCrew.net as a single-page site. About, Podcast (In the Loop), Events, Forums, and the store would have been sections within this one page. I conducted card sorting studies, where participants helped me determine the navigation menus for CoasterCrew.net and the fansites. This also told me what I should include in each section of the one-page site. The navigation menus’ links went to different parts of that one page. Then I created a wireframe. This had the layout and content of the site. This first screenshot is the whole page zoomed out. It’s hard to read the page at this distance, so here are some of the sections. I will include more pictures of this in future articles about the individual pages. The header of the site is largely the same as what you see on the site now. The current site’s header just uses a full-width background image and has only one button. I changed this later in the prototype. Here is the first prototype with no images yet. In the theme we decided on using later, the logo is on top of the background image and the background image is full-width. This shows one of the segues between sections on the one long page. This prototype had the logo and background image. The top section in this screenshot looks a lot more like the homepage’s header today. In development, I toyed around with putting the logo on the left and in the middle. Ultimately, I decided to leave it in the middle. Our first round of usability testing was on the aforementioned prototype. I took the testers’ feedback into account on this first development version of the page. This is a local version of the page rather than the actual WordPress site, so it only shows the page’s body. I developed this using the 1180px grid. Later, I switched to Foundation 4.3 because that framework was able to do more. This shows the About to Podcast segue and a technical problem with WordPress that took me weeks to resolve. Its auto-paragraph feature (wpautop, for those who know WordPress) was needed by our staff so that they wouldn’t have to know code to write content. In the layout I was developing, this feature added a lot of unnecessary spacing in the layout. Here’s how I fixed extra wpautop spacing in our theme (The One Pager by WooThemes). This goes in the custom.css file. #network-bar is one of my custom styles for this client’s site. That development version was deployed to a beta site for the second round of usability testing. Based on that feedback, parts of the prototype went back to the drawing board. The biggest changes were to our Events and Forums sections. These had a lot of content added to them in order to help the users of our site. Stay tuned for future posts about these two sections. By now, several sections of the site had become quite long. Linking to different sections of the single-page site was not as straightforward either. So our staff requested that I convert the site back to a multi-page layout. This involved substantial rework in the homepage design, including new sketches and a lot of tinkering with the design in the browser with Firebug. Moving back to a multi-page design takes more than copy and paste because, as a designer, I have to keep in mind the paths that users will take through the site. I have to make sure people will still visit all of the pages by making sure that the homepage gave a fair amount of space with them. 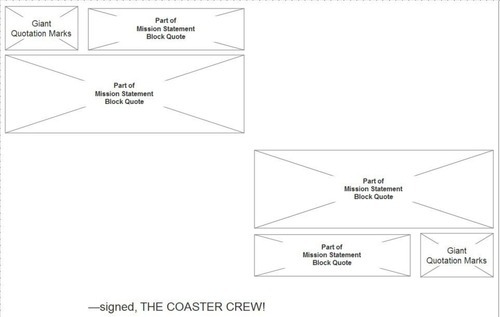 I ultimately decided to shorten the sections of the one-page layout, link to the full pages, and add one more section for The Coaster Crew’s social media feeds. This screenshot shows the segue from the shortened Events section to the shortened Podcast section. On desktops, the sections feature fixed-position backgrounds. I then did a third round of usability testing, incorporated nearly all of the feedback, and sent off the project for final launch prep. The site finished going live in early September. This is how the top of the live homepage looks at desktop, tablet, and mobile widths. Any of these layouts can display on your computer depending on how wide your browser window is. Stay tuned for the next article in this series. 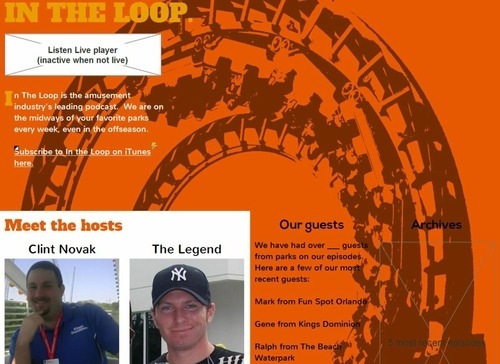 It will explain how my process enables Coaster Crew podcast listeners to stay In the Loop on the new site. Last week, I started a new series of articles about The Coaster Crew’s new site. So that I can expand my design portfolio, The Coaster Crew has graciously allowed me to redesign all of their sites. 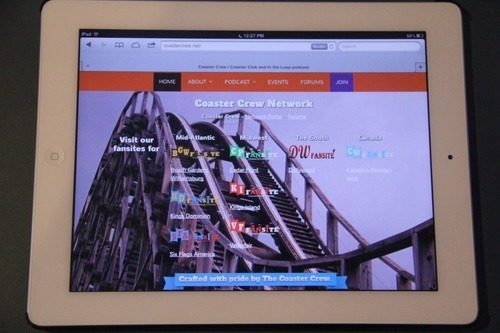 The new Coaster Crew site, which recently went live, follows the new Coaster Crew Network Portal site. I am a user experience designer. User experience (UX) includes a lot more than just web design. 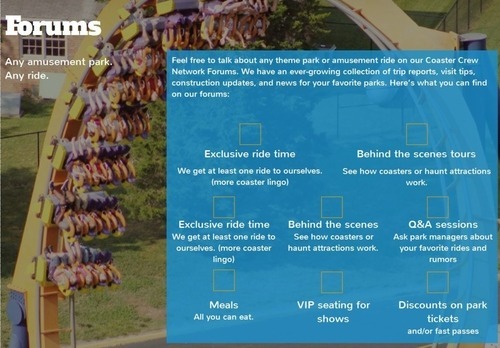 In effect, in a UX project like this one, I am dealing with affecting how you feel about the Coaster Crew and how you feel about the fansites. UX designers use established methods. This is to make sure that their sites are meeting the needs of their users. These needs include being able to find what you are looking for easily, having a pleasant experience browsing the sites, and wanting to come back to this community of people who love the same parks that you do. As a field of work, UX involves a lot. UX designers come into the UX field from graphic design, human factors engineering, computer science, marketing, and many other fields. My background is in computer science. I was a software developer before becoming a full-time freelancer in UX. UX also has a lot of sub-fields within it. Most commonly, people would divide UX into information architecture, interaction design, human-computer interaction, and visual design. In other words, as a UX designer I deal with how websites and pages are arranged (IA), how you interact with the site (IxD and HCI), and how it looks (visual design). Many people also say that industrial design (for example, design of iPhones and iPads), sound design, copywriting, sound and video production, and architecture of buildings play a role in user experience too. 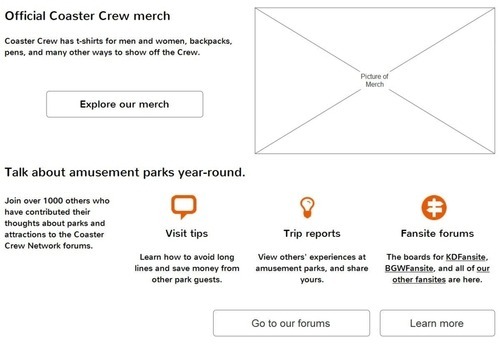 Today, I will describe how I used some common interaction design practices, surveys and personas, to help the Coaster Crew sites reach out to a broader audience. The Coaster Crew sites have long done a great job reaching out to coaster fanatics: people who ride coasters anytime they can, who know a dive loop from an Immelmann and a B&M from an Intamin. However, not very many park visitors are this crazy about coasters. Most people who go to parks love coasters and/or the other great experiences that amusement parks provide. But they don’t often know the makes, the models, the engineering behind all these great rides, or the terms that coaster enthusiasts use a lot. Reaching out to the general public more would give Coaster Crew a much larger base of park fans to join the club, invite to their events, and contribute to their sites. So I began this redesign project a different way. Instead of jumping right in to writing code or sketching new designs, I began by trying to understand the people that we are trying to attract to the site. My premise, which seems to have held up so far, is that coaster enthusiasts would still be served well even if the sites were designed for the general public as top priority. How often do you visit amusement parks? If you were to visit an amusement park’s fansite, what would you want to find out while you’re there? 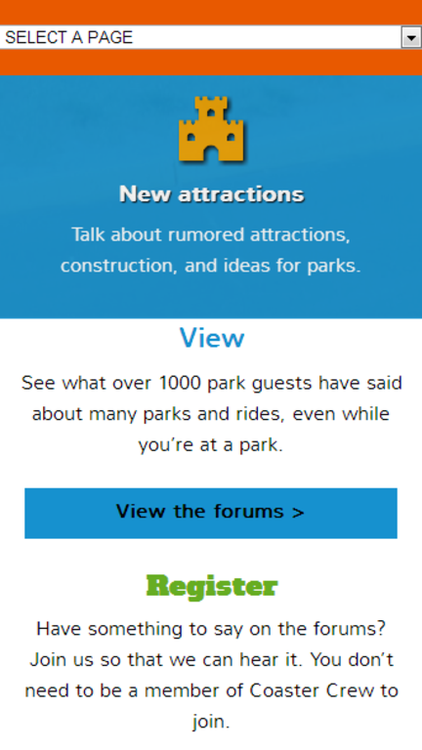 What frustrates you the most at parks, fansites, and forums? What do you think of the current fansites? Based on the whole survey, I came up with personas. Personas stand in for users throughout the rest of the design process. They are based on what designers find out in surveys, interviews, and contextual inquiries (watching people use their computers, tablets, and phones in the real world). But they’re not an average. No one has exactly 2.1 kids or visits parks exactly 3.5 times a year. A general public mother of two young children who doesn’t ride coasters but is interested in learning about fun things she and her kids can do together. Long lines were the top frustration for both enthusiasts and the general public, but a much bigger problem for the general public. I think this is because coaster enthusiasts tend to visit parks more often at off-peak times. The next-biggest frustrations for general public guests were costs and crowds. Coaster enthusiasts were more frustrated by a lack of appealing food options and ride closures. The general public’s biggest frustration with fansites was that it was too hard to find what they were looking for on the site. Coaster enthusiasts overwhelmingly reported that a lack of recent updates is their biggest frustration. More general public respondents than coaster enthusiasts reported that they were frustrated with fansites’ professionalism and look and feel. On fansite forums, coaster enthusiasts’ biggest frustration was that discussions go off topic. The general public’s biggest frustrations were 1) “I can’t post as a guest” and 2) “Rude/annoying people”. Both enthusiasts and general public visit fansites mainly to learn more about a park’s rides. Among other goals, coaster enthusiasts were most interested in special events, food at the park, and construction updates. General public were most interested in construction updates, special events, and visit tips. 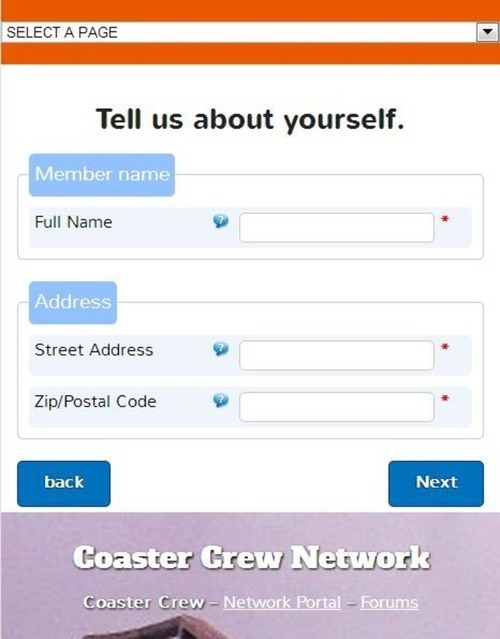 None of the general public respondents I polled have ever been a member of a coaster club, and only 1 of more than 60 had heard of Coaster Crew before the survey. Just over a third of the enthusiasts I polled had been in a coaster club, and over half had heard of Coaster Crew. Coaster enthusiasts liked the existing design more. They gave it higher marks in visual appeal, layout, and findability (the ability to find information they are looking for easily). 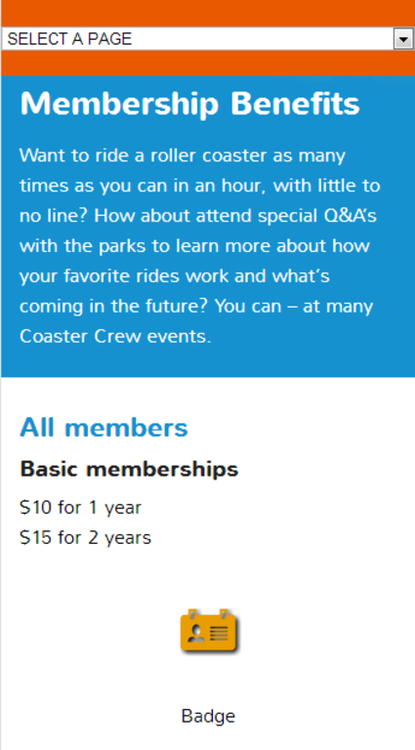 Since many people reported that they hate long lines, the new Coaster Crew site reports in plain view that our group usually has at least one ride to ourselves during our Exclusive Ride Time (ERT) sessions. Many people who tested the new Coaster Crew site noticed this and had very positive feedback. 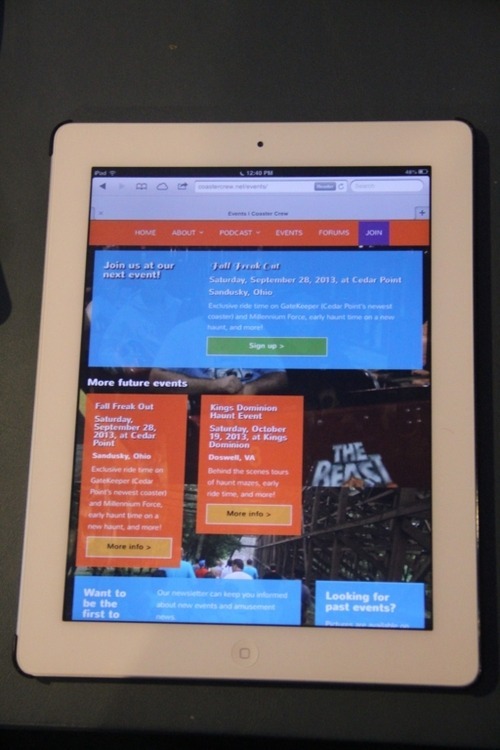 The mobile site brings Exclusive Ride Time and behind the scenes tours even more to the forefront. Right after the list of event perks, we give an invitation to our next event and a list of more future events. Many events list ERT as one of their perks, so this combination goes very well. 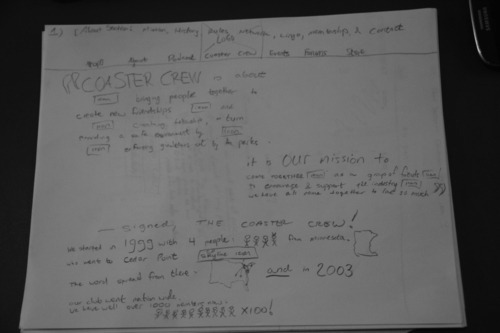 In later articles, I’ll explain how several of the pages in the new CoasterCrew.net design came to be. I’ll begin with the homepage design, which is a radical departure from their previous site. 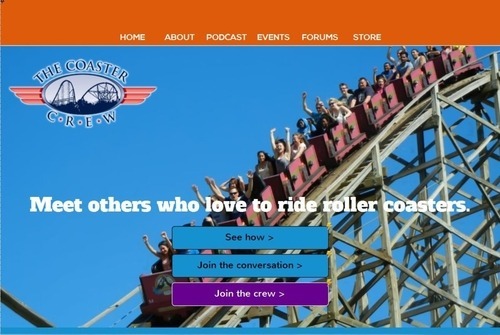 The new site for The Coaster Crew has now gone live. Seven months in the making, this is my second site for Coaster Crew, after their new Coaster Crew Network Portal was launched in June. 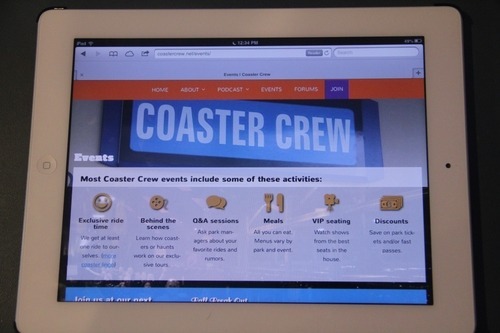 Like the Portal, the new Coaster Crew site uses a responsive design. This means that it is designed to look good on desktop computers, laptops, tablets, and smartphones. The Coaster Crew is a roller coaster club with over 1000 members in the US and Canada. I’ve attended several of their events in the past and really enjoyed interacting with other roller coaster enthusiasts, riding coasters in Exclusive Ride Time, and going on behind the scenes tours! I hope my schedule will allow me to attend their events again soon. One of the most interesting challenges of this site was helping Coaster Crew expand their audience of coaster enthusiasts to reach more of the general public. General public guests who enjoy riding roller coasters often don’t know about coaster clubs and tend to visit parks less often than enthusiasts do. However, there is not as much disparity between enthusiasts and GP in terms of which rides they tend to like, save for “hidden gem” rides at lesser-known parks that tend to receive much of their attention among only enthusiasts and small parks’ regional audiences. Over the coming weeks, I will continue to work on redesigns for the Coaster Crew fansites. The fansites have a more direct benefit for the general public, who should find several new sections for the fansites helpful. I began this project by researching the current and prospective users of the Coaster Crew sites. This is a common strategy for people in my profession, user experience design. I’ve written a whole article on how I did the user research for these sites. It will be the next article to go live in this series. 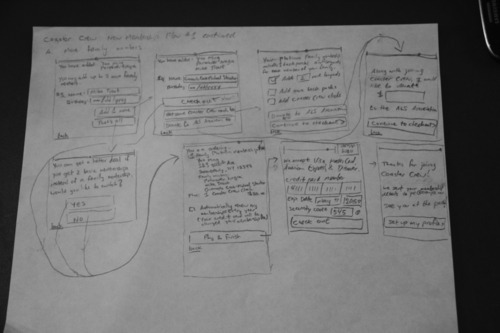 Next, I sketched out every page of the new site. 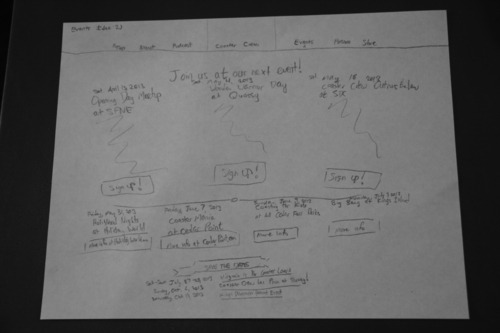 Many ideas in this original sketch for the In the Loop section were included in what is now the live site. 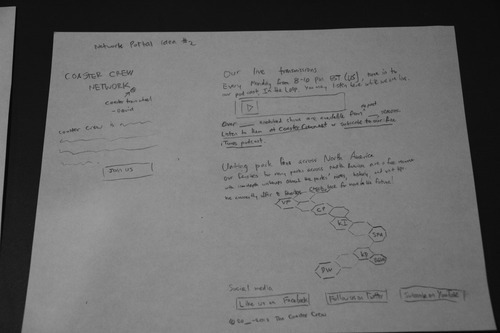 After that, I created wireframes for each page. This was an early idea for what is now the header on the homepage. 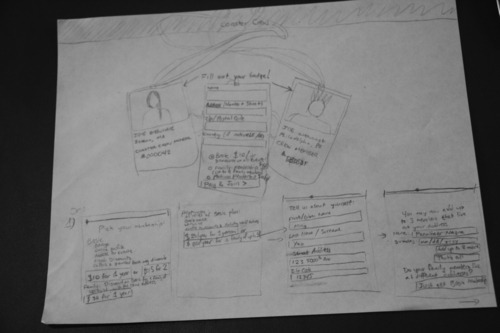 Then, I created the prototype for the site in three iterations. 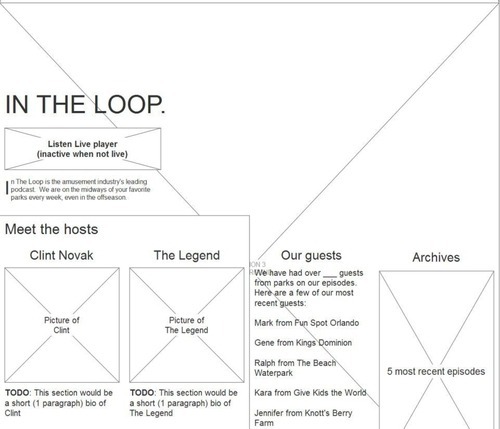 This is the second round of the prototype for the In the Loop page, as depicted in Axure. After a second round of user testing on a beta site, I created a final prototype. This Forums section is from that prototype. 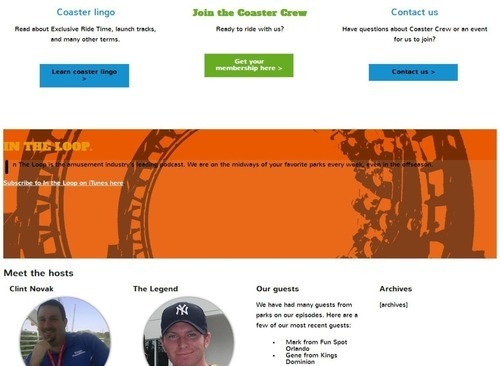 A third round of user testing on the beta site gave me some great feedback, like moving a section showing people what to expect at a Coaster Crew event to the top of the Events section. The BGWFansite and KDFansite staff and I donated some pretty striking pictures of coasters to use on the site. The mission statement appears over a picture of Intimidator 305 at Kings Dominion. 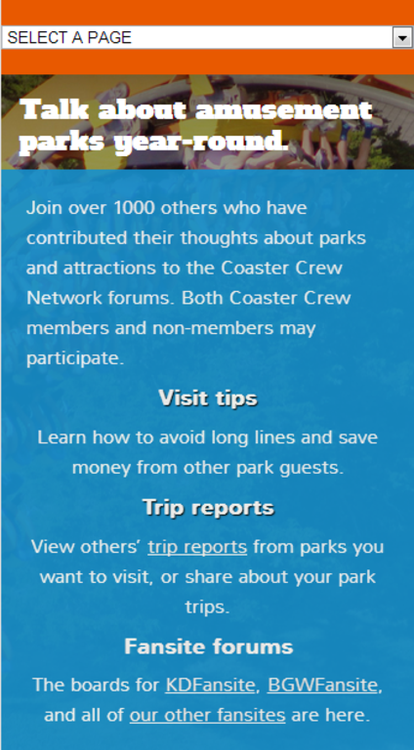 An infographic and call to action for membership highlight the new About section on CoasterCrew.net. A future article will show more about the design process for this infographic. I took the background picture at Hersheypark this season. 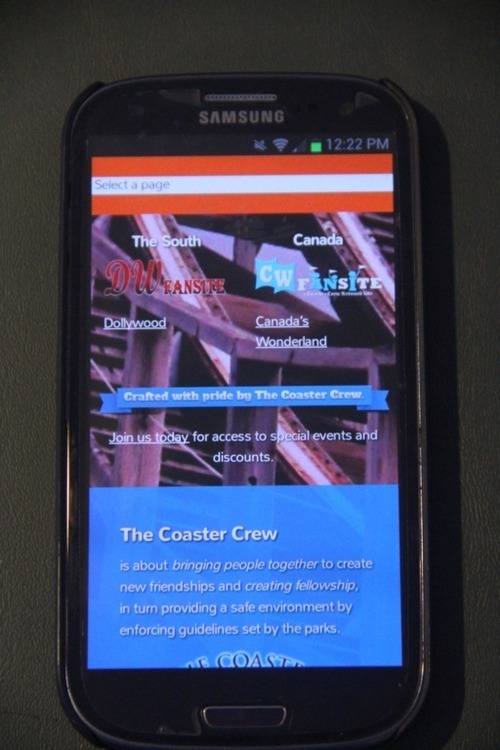 This is the first Coaster Crew site designed to be easy to use on mobile phones. This page allows users to listen to In the Loop on their phones. I mixed different font weights throughout the new Coaster Crew site design. This is the event list at mobile width. The new homepage features teasers of each section of the site. User testers loved how the background for each section stayed in one place as they scrolled it into view. This has been a great project to do. 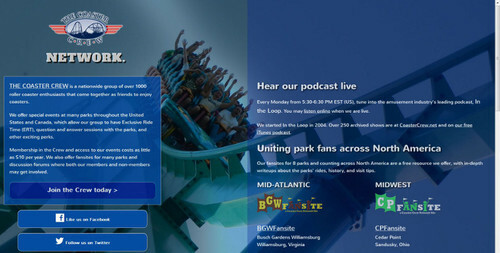 Explore the live site at http://coastercrew.net, and stay tuned for more articles describing how each page was built! The next one will describe how I learned more about the types of people in our current and target audiences. 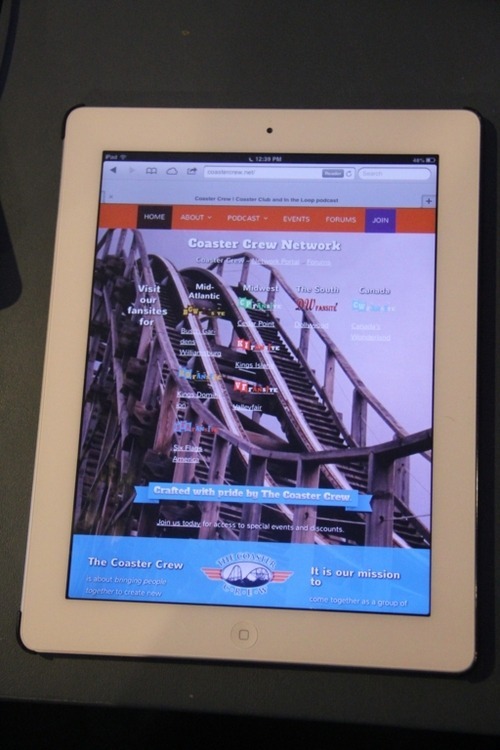 My first site for the Coaster Crew, the Coaster Crew Network portal, has now gone live. When I started working for Coaster Crew in January, I intended to redesign their main site and their fansites. I would redesign one fansite as a template for the other fansites’ staff to roll out the changes to their fansites. During the design process, I realized that the sites needed more than a bar across the top or bottom of each page for unifying the network’s brand. They needed a portal site to raise awareness of their brand and the different sites that they provide. The new portal site provides this in a responsive design which adapts to any device and window width. Findability was an interesting problem to tackle with the Coaster Crew fansites. Each of their fansites currently have very similar names, such as KDFansite, KIFansite, and SFAFansite. 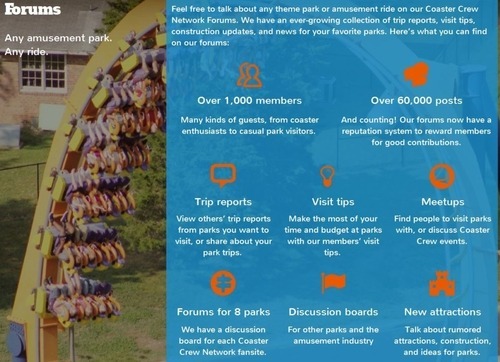 I thought about classifying the fansites by park owner, but the primary persona for the design would have been confused for any park chain other than Six Flags. Of all parks represented by their fansites, only one has the park chain’s full common name in its name (Six Flags America). Parks change hands over time too, and this can be a point of confusion for the users. I decided to solve this by classifying the parks by region and listing the parks’ names and locations with the fansite logo. It makes the webpage longer, but it enforces the correlation between fansite, park, and location to people who may have trouble with it. I mimicked the final site as well as possible using Axure RP 6.5. Certain features, such as the pinned background, work differently in Axure than they intend to work in the final product. Axure RP 7 will have more features for responsive design and is coming later this year. The site went through quite a few color schemes. CWFansite’s manager sent me the nice background picture of Canada’s Wonderland’s B&M gigacoaster, Leviathan, which served as a nice frame of reference for the rest of the page. Next, I coded the page using the latest version (4) of Zurb‘s Foundation Framework, with custom CSS. Due to licensing, we had to switch out a font that we had planned to use in the Portal and in the forthcoming CoasterCrew.net redesign. We’re now making better use of different weights of the same typeface, a theme you will also see in the fansites when their redesigns go live. Until now, the site had been using a color scheme based on Leviathan’s. The users who tested our site (in exchange for free Coaster Crew memberships) gave us overwhelming feedback that the text was too hard to read. GIMP came to the rescue. Putting two directional lights to focus the viewer’s eyes on the passing train made the background behind the text darker, and adding a translucent overlay or panel to the main content column made the text easier to read as well. One last change got us to the design that you see now. 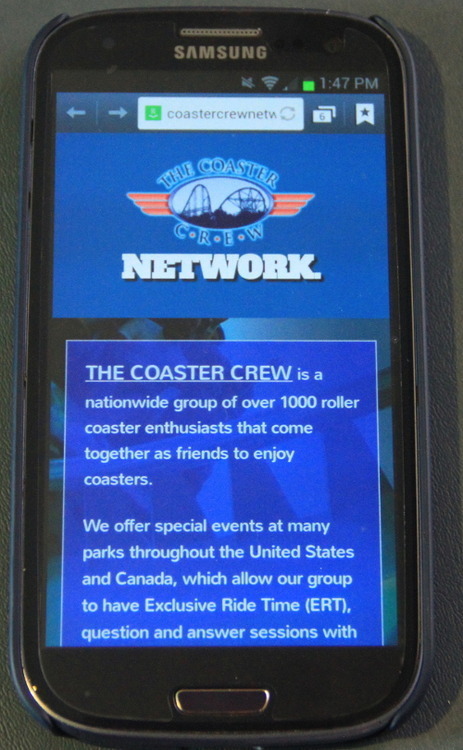 The “Coaster Crew” text in the header was replaced by a Coaster Crew logo, with “Network” placed to the right or below it depending on the window size. I would like to thank the many others from Coaster Crew, listed in the site credits, who contributed in various ways to this design and launch. If you are interested in doing usability testing for the other forthcoming redesigns, test opportunities will be announced via the Coaster Crew Facebook page. I am a freelance user experience designer focusing on the amusement industry: amusement and theme parks, ride companies, and other related companies. If you are interested in hiring me to work on a site or app for you on a freelance/corp-to-corp basis, please contact me via my website. 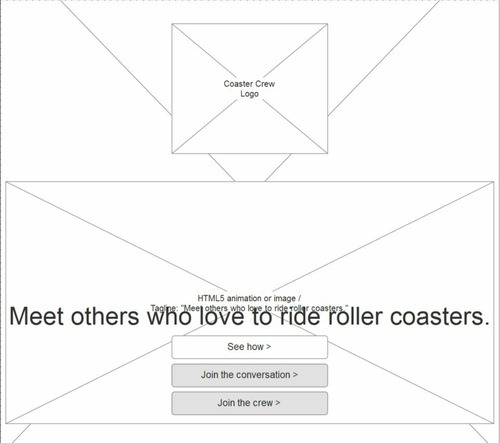 I landed a new UX redesign project in January for Coaster Crew and their network of fansites. So far, it is going great and is ahead of schedule. Currently, I am almost done with user surveys and about to make the personas. The user surveys are based at AYTM. The initial respondents were recruited through Facebook and Twitter. To get more respondents, I created new rounds of similar surveys at Mechanical Turk, ultimately targeting users in the USA and Canada. 1. To take a survey for free, people must already be passionately interested in your subject. In other words, people in audiences that your organization is trying to expand into will most likely not take your surveys for free. When the first surveys were launched, I expected a relatively even split between coaster enthusiasts and general public. We had announced the surveys throughout Coaster Crew’s social media channels. Instead, the first round gave us less than 30 responses. When I noticed that most of the respondents had ridden hundreds of different coasters, I realized that this only catered to coaster enthusiasts. So I had to split the survey in two to get both coaster enthusiasts and general public (GP) to respond. 2. Therefore, if you want a big sample size, expect to pay up. Workers want a fair rate. And they deserve it. Turker Nation, a large community of Mechanical Turk workers, accused me of promoting slave labor on Twitter for the rates that I was paying. a) I’m not getting paid for this project. In their tweet, Turker Nation said, “Would YOU work for that?” (shouting theirs). I am working on this project for free – because I love theme parks, because I love being part of Coaster Crew, because I see it as a way to give back to Coaster Crew for years of letting me go to their events, and because I need work for my UX portfolio (particularly in amusement – my main target industry). Therefore, when I was writing the proposal for this project, I was assuming I wouldn’t have to pay my respondents – or, for that matter, my usability testers. b) Our budget is low. To my knowledge, Coaster Crew has no full-time employees. All of us have outside jobs, have our own companies, or are students. The organization is on a lean budget and interested in branching out to have events at more parks and fansites for more parks. I want this project to further these initiatives and not cause them to be disrupted in the short run. Within the past year, they have launched several new fansites. I would rather concentrate money on making sure the end result is as professional as possible. So if I were to only have a couple hundred dollars to work with, I’d invest in high-quality, responsive WordPress themes as the highest priority. For the record, I do not send my Adobe receipts to my clients and tell them to pay me for the tools I use to do the job. c) Surveys need a representative board of respondents. For that, you need a lot of respondents. I was trying to get the most respondents within my budget as I could. I would use MTurk for low- or medium-budget projects such as these. If money were no object, I would just use AYTM’s panel. Originally, I was dreaming big – 3000 respondents would answer my survey for free. Doing this on AYTM’s panel would cost about $90,000, and double that if there is even one prequalification question on the survey. However, for a smaller-scale, still high-budget survey, AYTM’s panel would produce amazing results. I can target it not only by country but by states and counties, so it would be very easy (if expensive) for me to hire a similar set of respondents as the parks would want in their own marketing surveys. AYTM’s tools for doing this are truly powerful. Their interface is a lot easier to figure out than MTurk, and (even in their free surveys) you can slice and dice presentation data almost any way you like to get great data to back up your personas. 3. Target your surveys by location. Fortunately, the free first round of our survey gave us great results for the coaster enthusiasts – because the results we paid for in the coaster enthusiast survey did not. 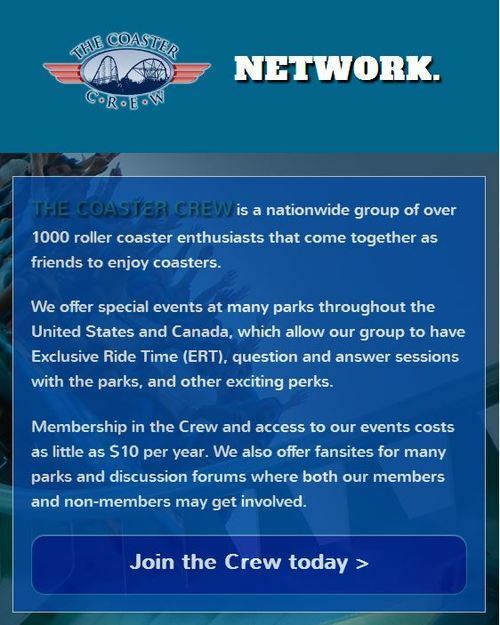 Coaster Crew presently serves the fans of parks in the US and Canada. Only 3 of our 69 respondents to the “enthusiasts” survey were based in either of those two countries. Most of the others were based in India. a) Coaster Crew doesn’t target the parks in India, so these are the wrong users to research even if they have the necessary coaster count to qualify for taking this survey. b) Per RCDB, there aren’t even 100 currently operating roller coasters in India. c) Most of the respondents indicated they would not drive more than 6 hours to visit an amusement park. So most likely, they have not ridden any coasters outside India. So, combining b) and c), most of these respondents did not really qualify to take this survey. But I couldn’t reject them (although I rejected some for failing to follow the instructions), because the acceptance criteria didn’t spell this out. I paid the price for this. Fortunately, the free survey in the first round gave me at least some data on the enthusiasts, and I’ve been part of that community for years as well. Interestingly, the GP survey got no respondents at its original reward price. I canceled that batch and launched two new GP batches for the US and Canada. With the tricks below, I got much better data. 4. Clarify your qualification questions. We had a “coaster enthusiasts’ survey” that was intended for those who had ridden at least 100 different roller coasters. By comparison, I’ve ridden about 80 so far. So I am close to the cutoff for “enthusiasts” even though I plan whole vacations around roller coasters, have been to several ERT sessions for members of coaster clubs, know what ERT is (exclusive ride time), know coasters by their make and model more than their names, and so on. “Coaster count” is a widely understood term in the coaster enthusiasts’ community. However, the general public seems to not think in those terms. They’re not going around the world to ride kiddie coasters at special club events just so they can have 700. Add to that the cross-cultural challenges I had in the first round of the survey (as I described earlier), and people took this qualification question to mean, “Have you ridden a roller coaster at least 100 times?” I think that is what tripped up the respondents in the first enthusiasts’ survey on MTurk. 5. Have written questions that require people to post relevant answers – and reject anyone who gives a nonsensical response. In that survey, I got some truly absurd answers. Survey respondents were asked a standard question: “When you use the website of any coaster club, do you find anything frustrating that you wish was easier? If so, what?” One person responded, “last month”. I couldn’t reject their task because I didn’t ask for a Worker ID. So that was one thing I added in the next round of surveys. Most importantly, I added two standard questions: 1) What is your favorite ride at any amusement park? and 2) What is your favorite amusement park?. These are great ways to understand both enthusiasts and the GP, as well as guards against nonsensical data showing up in the surveys. In AYTM, I can easily reject or filter out answers that don’t make sense when I publish my survey results. 6. Ask MTurk’s support team for help whenever needed. MTurk’s interface for new requesters is daunting, to put it nicely. Commands like “Cancel this batch” leave me with more questions than answers: if a batch is canceled, do I get the money back? Are workers that completed the survey still paid? … and so on. I am also not sure what republishing a rejected assignment for other workers to complete means. I rejected 18 of 69 respondents in the enthusiasts’ survey based on my acceptance criteria. Several emailed me asking why, and in only one or two cases (with all of my surveys) have they actually come back and submitted the survey properly, allowing me to approve their previously rejected assignment. The interface and UX for this are backwards, though the task itself does not take very long after you figure out how. Their support team was responsive in telling me how to do this. Between their UX and their lack of clear documentation, I had to call MTurk’s support team about 3 times in the first week. So those are some lessons I learned in using MTurk to do user surveys. 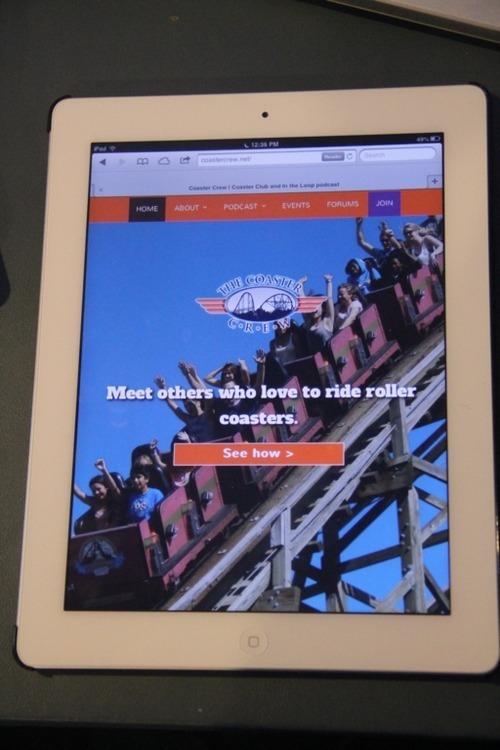 Next, after all of the surveys have concluded, I will share some of my findings from the surveys themselves – to help you all understand a bit about how roller coaster enthusiasts and general public amusement park visitors use the web and coaster club sites.